Call it Karma, call it whatever you want. Everything I know is that the notion of life itself having an intrinsic balance seems more realistic to me than ever. Today, while surfing the internet, I found out about a company called Airbandb, founded by fellow RISD graduates, Joe Gebbia, Brian Chesky and Nathan Blecharczyk. Their premise is to have several people all over the world rent their spare rooms or real estate on a daily/weekly/monthly basis, just like in any hotel. The amazingly positive news on this company is that they are located in San Francisco and currently hiring people with worldwide mobility to open new markets. I plan on paying them a visit next week, while I take a Mercedes rear-end to René at Burlingame Motors, and help my friend Alex move to the area. However, just as life gives, life takes away. Minutes after my wonderment at this company I get a call from my mechanic, David, who did not have good news to tell me: the part of the car's body to which the rear suspension elements attach was so corroded, so rusted out, there was no way of repairing it affordably to make this Mercedes a reliable diver. I was in such disbelief, in such amazement, I could not but run the 30-40 minutes of highway that it takes to get to his property in the countryside, just to check it by myself. And there it was. Rust everywhere. It took me good part of 20 minutes to try everything under the sun –fingers, sockets, breaker bars- to prove that, evidently, there was no way of taking apart the rear suspension in a way that it could be put back together to travel safely. There were holes around the mounting points where the fasteners attach the suspension to the body of the car, a big red light and ticking time bomb in the event of a large pothole or a speed bump –no good, no good. So, Orwell, the once-called PanAmerican wagon, is now a –beautifully- running a parts car. There are two factors that saved the day, the first one being the fact that I got that W123 Mercedes for so cheap –$1,200... and driven 800 miles-. There is no possible way not to get my money back. I have sold $110 worth of parts as we speak, so the recovery of my investment should not be an issue. After some repairs to make it 100% reliable, I got this for a little over $3,500. 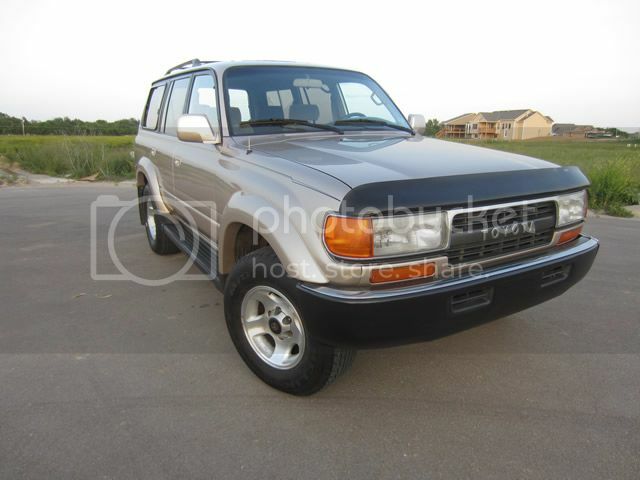 Yes, it is a 1994 FJ80 Toyota LandCruiser with low miles, low price, a salvage title and in ready-to-go condition. It has a bullet-proof inline-six and it is fairly popular in Latin America, with plenty of cheap spares and labor if anything should break down. Not half as interesting, but much more comfortable than my bizantine Mercedes, with some additional cargo/sleep space, ground clearance and 4 wheel drive. Ready to take on an expedition lasting several months with a little more work –belts and seals-. Tyler let me drive it for a few days before taking it to auction and I was very impressed. It even has pinstripes and a sunroof! This will be the rig that I will take to San Francisco and that I will slowly start to modify to make it into a somewhat liveable space. At 15-20MPG, I definitely have to save some money in lodging, but I rather pay for fuel than for speedily imported parts and complex mechanical repairs. It just took a few hours for fate to change one of the biggest factors in this future PanAmerican journey –the vehicle, darn!-, but this decision, as big of a game-changer as it is, will be one I will not regret while on the road, especially in adverse conditions. And much against what I wanted to do with Orwell –scrap it at the end of the journey-, BY THE SHEER FORCE OF MY BALLS I shall drive this nameless warrior back to the US with a job offer under my arm and a grin on my face. Well you are on expedition portal alreadY!! !